I love getting more mileage out of my punches . 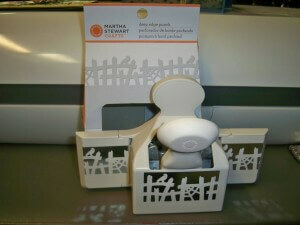 I got this punch from HSN its from Martha Stewert’s Halloween collection , I am getting a new collection every two month , I recived this set this month and the Creepy fence is so awesome , its not Halloween yet so at clipped out the spider webs and then punched out the birds in blue card stock to lay over the bird , I think it turned out really cute , not so creepy now .. 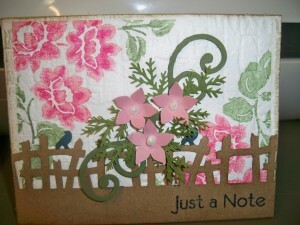 I also used a Unity stamp (http://www.unitystampco.com/product/22-all-worth-it.aspx ) , I colored it with markers and stamped it then ran it thru the Tim Holtz brick wall embossing folder , I made a spray of flowers to lay down the center and added scribbles pearl paint in the center of flowers , more milage from this punch wouldn’t you say .. by the way this punch will not be avaliable until 2012 , only the punch club members got this punch early ..Love it !! !